We declared on Facebook that 2015 is the year that we break out of our comfort zone and plant tropical plants. Over Christmas break, we did something we had not done in years: we took a trip to the library. I returned home with George Little and David Lewis’ gem of a book A Garden Gallery. Their book is a wealth of knowledge regarding what tropical plants will succeed here in our beloved Zone 8. I cannot speak highly enough of this book or the gardening duo who wrote it. Little and Lewis offer this advice: trust yourself and go with what feels right. In other words, garden with your heart and don’t overthink it! 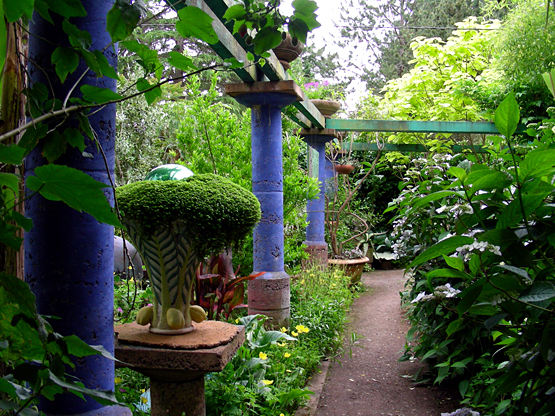 Their world renowned garden located on Bainbridge Island is a living gallery of tropical plants juxtaposed with concrete sculptures and paintings of their own creation. What makes tropical plants so attractive is their unique ability to transport you to another place. 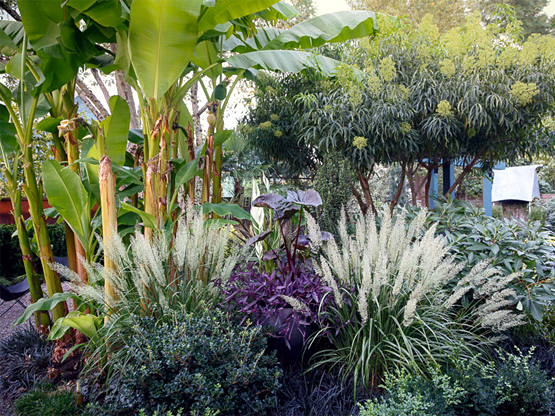 They offer all of the characteristics for good plant design: color, structure and texture, and yet, they are the exception in most Pacific Northwest gardens. This year, I vow to plant at least one Musa basjoo (banana tree), and all of the plants listed below. Canna ‘Tropicana’ – It’s no wonder that it’s considered by some to be the most striking of all cannas. 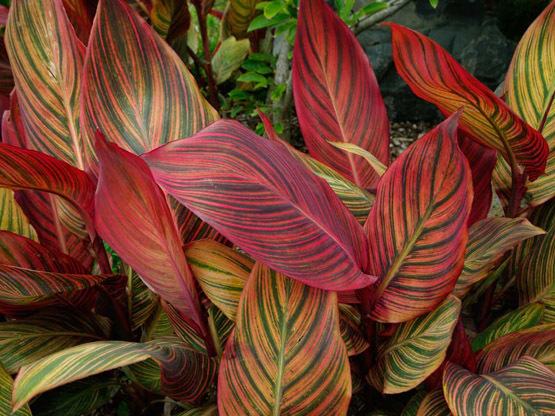 Its stunning multicolored foliage is reason enough to plant it, but come summer, it delights even more with orange flowers. 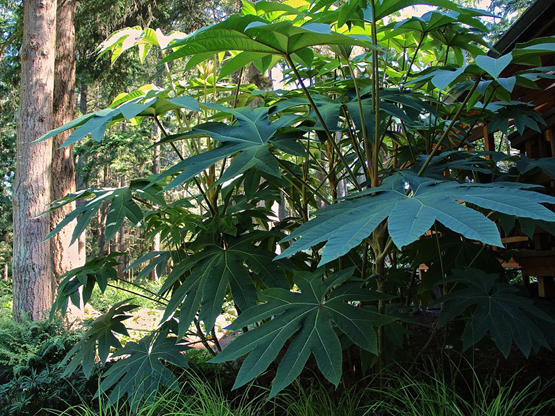 Rice-Paper plant – I first came across this massive, sculptural plant at the Bainbridge in Bloom garden tour in 2012. We were blown away by the impact of its large, jade-green leaves and Jurassic Park feel. It can reach 20′ in height with a span of up to 15′, so plan for mature growth. 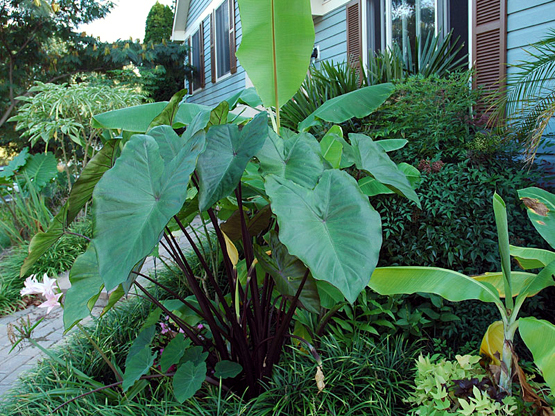 Elephant Ears ‘Black Stem’ – Giant, shiny, heart-shaped leaves set atop black stems that can grow up to 7′ in height. Yellow flowers produce a fragrance of papayas. Need I say more? Banana tree – I’ve seen these growing in Costa Rica where they are massive. Here, their height and spread will reach 14’. For you doubters out there, Musa basjoo has survived winters as far north as New England and Ontario, Canada. 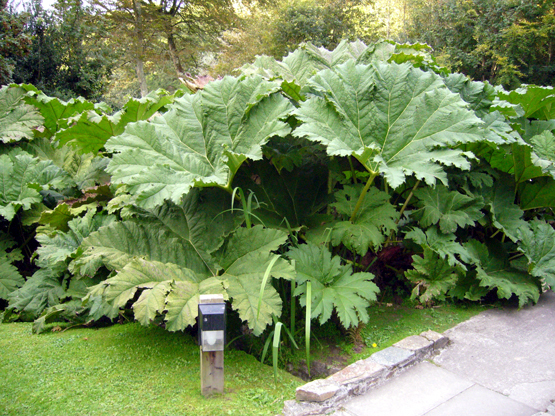 Dinosaur Food – My first encounter with Gunnera was at The Bloedel reserve, and if I remember correctly, it’s planted in a bed with heathers and hydrangeas. So don’t be afraid to plant it next to more common garden plants. This is another plant much loved for its leaves, which can reach 6-8’ across. What tropical plants do you love that will thrive here in Zone 8? Log in to Facebook and let us know in the comment section below!